The first Aussie dogs are gorgeous and iconic Australian Kelpies – Jeffrey, Denzel and Finn. Next, its Hinto, the sweetest Australian Shepherd. And boy, was he a clever boy! And a super cute treat, Australian Cattle Dog Ruby and three of her puppies. I was so fascinated with these three white pups – wonder when their Blue Heeler spots are going to develop. Time for this gorgeous cheeky little man, it’s Australian Terrier Jedi! He was every bit the star when being photographed! Australian Bulldog time! Sweet six month old Pippa had the best face and expressions for these props! Also donning the Australia Day ears is Australian Silky Terrier Bailey. Such a cutie too! Australian Cattle Dog, Liberty Belle, at the beach with a giant Aussie themed thong. I’m not sure that it gets anymore Aussie than that! Australian Shepherd Barkley was the perfect Aussie dog, especially with his awesome tricks! Yep, it’s official Australian Bulldogs have a great face for fun Aussie Day dress-ups! Dougie and that huge tongue were perfect! With her sweet green and gold bow tie, its Jedi’s best bud, Billie. 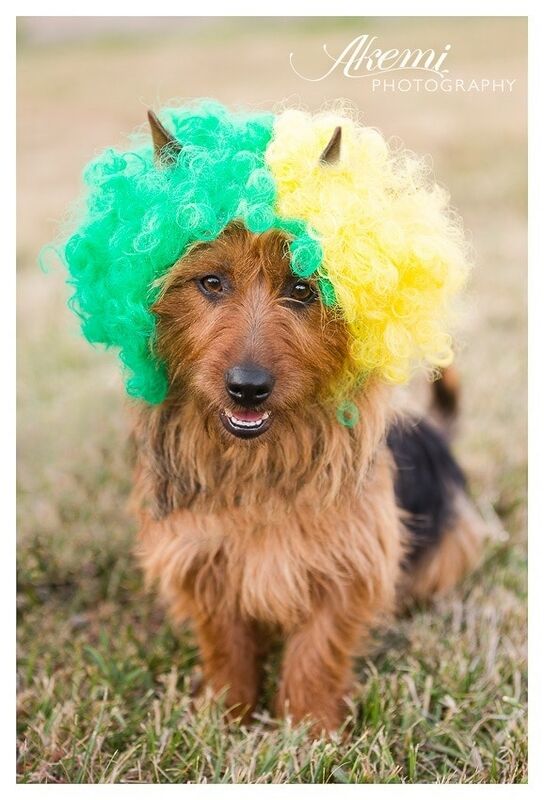 She’s also an Australian Terrier. Lastly, just because I can’t resist a cute puppy, it’s another of Ruby’s adorable babies! Clearly all the Australian Day celebrations have tuckered him out! Is that enough Australia Day cuteness of you? Do you have a favourite? Leave some love!